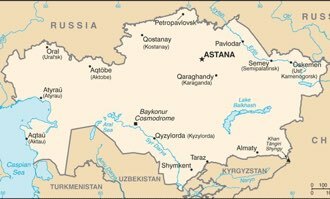 Kazakhstan : When and where to go? The climate here is extreme: very hot in summer with temperatures rising to 40 ° C during the day, very severe winters and snowy, violent oranges during the warm season with floods locally. Astana is the current capital: created by architects of all origins, this city-mushroom mix styles and can not leave indifferent by its audacious constructions. The town of Djambou (formerly Taraz) is on the Silk Road and is surrounded by castles, mausoleums and ancient forts: it also has a museum of regional history where are exhibited numerous archaeological objects . You need a visa to enter the country, as well as a proof of invitation or contract of employment for a stay of more than 30 days. The current currency is the Tenge (KZT). Budget, it can vary according to your comfort requirements: if you take public transport and choose restaurants and low-end hotels, you can spend less than 40 € per day. Health: it is recommended to have its universal vaccinations up to date, and to add those against hepatitis A and B. Be also vigilant with regard to the water which is mostly not drinkable: bottled water. Security: tourists are unlikely to be at risk in this country, even if terrorist acts took place in 2011. However, avoid the vicinity of official buildings, do not walk by night, do not use taxis " Wild ". Do not frequent the region south of Kourtchatov and Semipalatinsk, which has a high level of radioactivity following the Soviet nuclear experiments. Also avoid the border with China. Another risk to report: Almaty and its perimeter are located in seismic zone.